The result of a three year state-led collaborative effort, the College, Career, and Civic Life (C3) Framework for Social Studies State Standards was developed to serve two audiences: for states to upgrade their state social studies standards and for practitioners — local school districts, schools, teachers and curriculum writers — to strengthen their social studies programs. Its objectives are to: a) enhance the rigor of the social studies disciplines; b) build critical thinking, problem solving, and participatory skills to become engaged citizens; and c) align academic programs to the Common Core State Standards for English Language Arts and Literacy in History/Social Studies. In June 2017, a Religious Studies Companion Document was added as a Supplement to the C3 Framework. It is included in the downloadable pdf file of the Framework. What are the guiding principles? Social studies prepares the nation’s young people for college, careers, and civic life. Inquiry is at the heart of social studies. Social studies involves interdisciplinary applications and welcomes integration of the arts and humanities. Social studies is composed of deep and enduring understandings, concepts, and skills from the disciplines. Social studies emphasizes skills and practices as preparation for democratic decision-making. Social studies education should have direct and explicit connections to the Common Core State Standards for English Language Arts. What are the instructional shifts for social studies? The C3 Framework, like the Common Core State Standards, emphasizes the acquisition and application of knowledge to prepare students for college, career, and civic life. It intentionally envisions social studies instruction as an inquiry arc of interlocking and mutually reinforcing elements that speak to the intersection of ideas and learners. The Four Dimensions highlighted below center on the use of questions to spark curiosity, guide instruction, deepen investigations, acquire rigorous content, and apply knowledge and ideas in real world settings to become active and engaged citizens in the 21st century. The C3 Framework changes the conversation about literacy instruction in social studies by creating a context that is meaningful and purposeful. Reading, writing, speaking and listening and language skills are critically important for building disciplinary literacy and the skills needed for college, career, and civic life. Each of the Four Dimensions are strategically aligned to the Common Core State Standards for English Language Arts and Literacy in History/Social Studies. Why do we need the C3 Framework? Marginalization of the Social Studies – The loss of instructional time at the elementary level and the narrowing of instruction in response to multiple-choice, high-stakes testing has significantly impacted time, resources, and support for the social studies. The introduction of the Common Core provided an opportunity for social studies educators to re-frame instruction to promote disciplinary literacy in social studies in such a way as to allow social studies to regain a more balanced and elevated role in the K-12 curriculum. Motivation of Students – Children and adolescents are naturally curious about the complex and multifaceted world they inhabit. But they quickly become disengaged when instruction is limited to reading textbooks to answer end-of-chapter questions and taking multiple-choice tests that may measure content knowledge but do little to measure how knowledge is meaningful and applicable in the real world. The C3 Framework addresses this issue in fundamental ways. The Future of Our Democracy – Abundant research bears out the sad reality that fewer and fewer young people, particularly students of color and students in poverty, are receiving a high quality social studies education, despite the central role of social studies in preparing students for the responsibilities of citizenship. Active and responsible citizens are able to identify and analyze public problems, deliberate with other people about how to define and address issues, take constructive action together, reflect on their actions, create and sustain groups, and influence institutions both large and small. They vote, serve on juries when called, follow the news and current events, and participate in voluntary groups and efforts. Implementing the C3 Framework to teach students to be able to act in these ways—as citizens—significantly enhances preparation for college and career. For these reasons and many more, thousands of social studies experts, curriculum specialists, teachers and scholars from across the nation, and the following organizations have been involved in the development of the C3 Framework. The College, Career and Civic Life (C3) Framework for Social Studies State Standards re-envisions the purpose and instructional practices of social studies education in the states. Through a grant from the Bill & Melinda Gates Foundation, National Council for the Social Studies, in partnership with the National Center for Literacy Education (NCLE), developed these free professional learning tools, and resources to help school teachers from across the nation use the College, Career, and Civic Life (C3) Framework for Social Studies State Standards. … an indispensable guide for teachers implementing the C3 Framework. NCSS published the national curriculum standards for social studies in 2010. 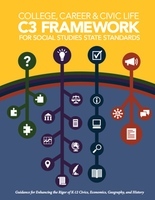 "The Links between the C3 Framework and the NCSS National Curriculum Standards for Social Studies" (Social Education, November/December 2010) describes the ways in which the C3 Framework corresponds with the national standards and identifies the distinctive contribution made by the C3 Framework.